The minimalist Steel & Glass House — the last home architect Donald Wexler had a hand in designing — is on the market for $2.4 million. 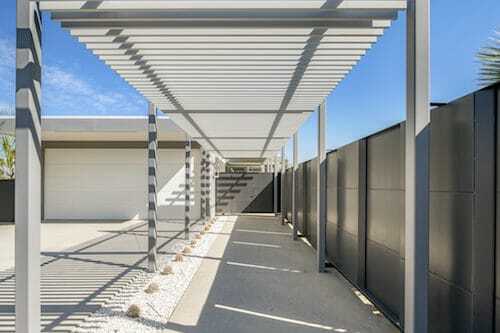 Completed in 2015, the three-bedroom, three-bathroom, 2,550-square-foot house was built on a parcel of land that was formerly a part of the Frank Sinatra Estate. 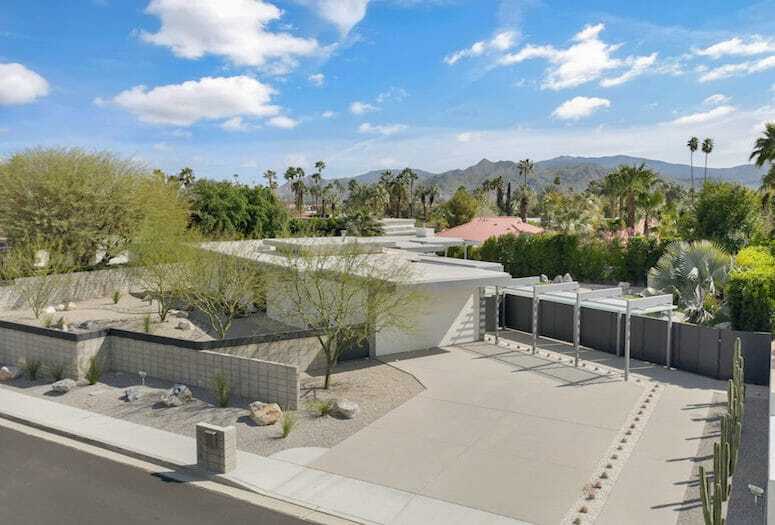 In 1961, architect Donald Wexler and his then partner, Richard Harrison, teamed with the Alexander Construction Company to build a 35-home subdivision of steel and glass houses in the Racquet Club neighborhood of North Palm Springs. The idea was to create low-cost homes that were suited to the extreme desert climate. Unfortunately, the price of steel skyrocketed, and construction stopped after only seven of the homes were built. But the dream lived on. The Movie Colony East residence shown here, known as the Steel & Glass House, is the last home Wexler had a hand in designing; the plans were finalized not even two months before he died in 2015. A colonnade and wall, both made of steel, lead to the front entrance. The house is sited on a 45-degree angle to optimize energy efficiency and views of the San Jacinto Mountains. The layout of the three-bedroom, three-bathroom, 2,550-square-foot house is open and bright. Its clean, minimalist interior design — pop-up raised ceiling, walls of windows, galley kitchen, and reflecting pool in the center of the home — perfectly match the architecture. 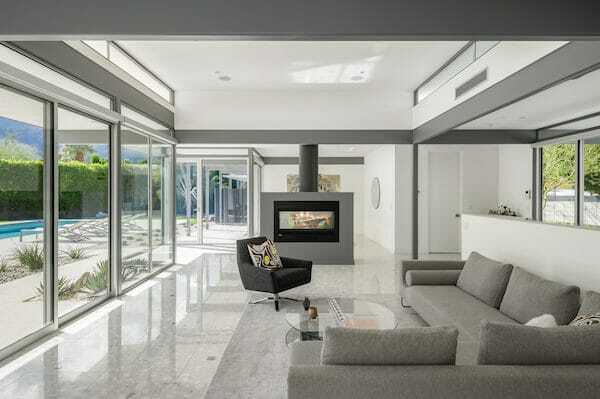 Terrazzo floors flow throughout the residence and the living and dining areas are separated by a two-sided gas fireplace. Other features include terrazzo floors; a two-sided gas fireplace between the living and dining areas, along with another fireplace in the master bedroom; Thermador appliances and Poggenpohl cabinets in the kitchen; and Hansgrohe fixtures throughout. In lockstep with the architecture and interior design, the landscape has a minimalist aesthetic. Quartz crystal runs through the entryway and into the first third of the house, and the linear lines extend to the exterior space. The master bedroom placement frames the majectic mountain views. For more information, contact Rich Nolan, The Agency, 760-219-1357, richard.Nolan@TheAgencyRE.com.